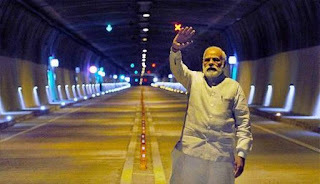 This tunnel would be India’s longest and Asia’s longest and strategic bi-directional tunnel which is expected to be finished within five years. It is a 14.2 long tunnel which will provide all-weather connectivity between Jammu and Kashmir’s Srinagar, Kargil and Leh districts. It will be constructed at an altitude of 3,528 metres high Zojila pass and is expected to bring down the travel time from 3.5 hours to 15 minutes. The overall budget for the construction of the Zojila Tunnel is of Rs 6,809 crore. It is being implemented by the Ministry of Road Transport and Highways (MoRT&H) through the National Highways and Infrastructure Development Corporation Limited (NHIDCL). The project has strategic and socio-economic importance and it aims to develop the economically backward districts in Jammu and Kashmir. It would make sure that the land transportation is not disrupted in the region after the snowfall. The construction of the tunnel was approved by the Cabinet Committee on Economic Affairs in January 2018.